It's not the holidays without a mention of mistletoe in these parts. Oft invoked as a plant of love, hung in doorways and from ceilings to catch two people in a kiss. Which I at first thought pretty odd, considering its berries are toxic! Have you noticed that some of the most magical plants are often repellent or somehow toxic? Mistletoe is an extremely protective plant. It's often used for protection in houses, which is some of where its hanging comes from, to ward against evil energies and that which contains them- for example, hung in external doorways to protect against thieves, bedroom doors and window frames to protect against bad dreams, etc. Perhaps as an alternative to your usual protective herbs, consider mistletoe for protection. 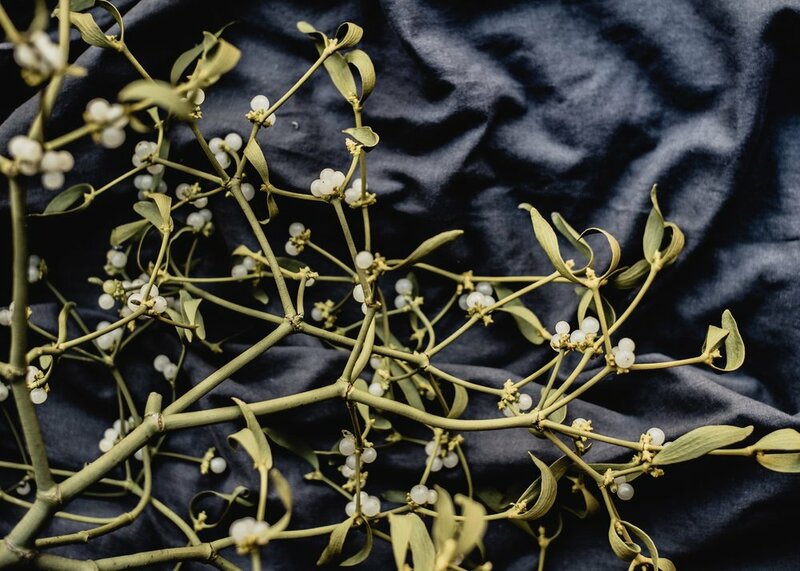 Protection and healing go hand in hand and mistletoe is particularly useful when trying to heal from poisonous emotional and spiritual hurt. An ancient Druidic herb of fertility, gathered at solstice, mistletoe was used to bless and invoke children. Which naturally threads to its connection to love and desire. Mistletoe has other uses than trapping...err catching love. It mostly grows as a parasite on host trees, even on some of your magical favorites like apple, oak, and birch. You can invoke this energy in your linking rituals and spells. It conducts energy wonderfully, and its stems and twigs often used for making wands and brooms. An evergreen plant, it was associated with longevity and immortality and was commonly used throughout the year- though of course evergreen plants are most commonly used in the winter because other plants are so much less available.